This upscale 4 bedroom, 2 bathroom executive apartment is perfect for a group that wants to be in the action and close to all restaurants, bars and shopping in beautiful downtown Revelstoke! Located right downtown, The Grizzly Den sleeps up to 8 comfortably. Fully furnished including a King, 2 Queens and a bunk with a single and a double. Great for groups, couples or families alike. 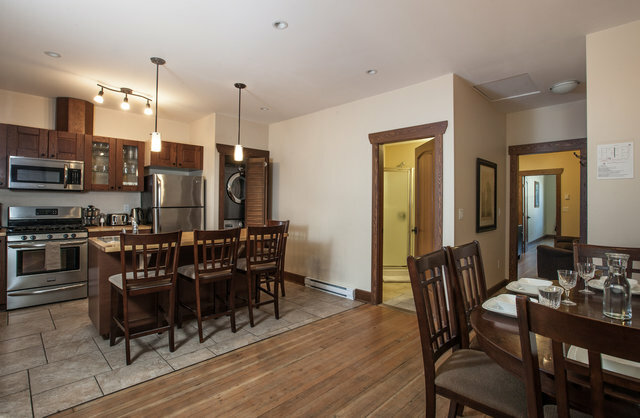 Grizzly Den comes complete with upscale furnishings, gourmet kitchen, original historic wood flooring throughout and a back deck overlooking Revelstoke Mountain Resort, which is perfect for a relaxing evening or to ramp up for a big night on the town. Arrive with nothing to think about except relaxing during your stay.